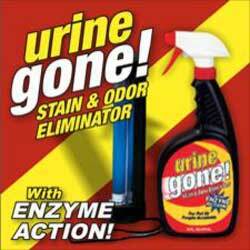 Urine Gone™ effectively removes new or old stains and odors from carpets, mattresses, furniture -- just about any washable surface or fabric! All you do is darken the room and use the included "stain detector" black light to show the urine messes. Just spray Urine Gone™ on and let it dry. Stains and odors disappear and keep pets from re-marking their territory.